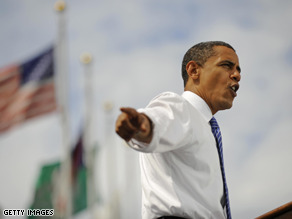 Obama is ahead in two key states, according the latest CNN poll of polls. (CNN) - Barack Obama holds leads in critical battleground states of Iowa and Pennsylvania with only six weeks remaining until Election Day, according to just released CNN poll of polls. New surveys also released Monday suggest Obama and John McCain are locked in statistical ties in two other crucial swing states. According to CNN's Iowa poll of polls, Obama holds a 7-point lead (50-43 percent) in the state that narrowly voted for President Bush in 2004 and gave a major boost to Obama's presidential fortunes earlier this year at the start of the primary season. A poll of polls out of Pennsylvania shows the race there considerably tighter, with the Illinois senator - who lost handily to Hillary Clinton in the Democratic primary there - holding a slim 3 point lead over McCain (47-44 percent). Both the Iowa and Pennsylvania poll of polls consist of three recent surveys out of both states, and neither carries a margin of error. In Minnesota, the site of the Republican convention earlier this month, a new American Research Group poll suggests the race there has tightened considerably, with Obama holding a 1-point lead (46-45 percent) that is well within the survey's 4 percent sampling error. A new Suffolk University poll out of Nevada also suggests the race there is a dead heat, with McCain holding a 1-point lead (48-47 percent) that is again well within the poll's sampling error. CNN considers both Iowa and Pennsylvania as "leaning Obama" in its electoral map breakdown ,while Minnesota and Nevada are considered tossup states. As long as there is an electoral college, my vote doesn't count. If you are in a key state, your vote is worth far more than mine. This is not a country of "one man, one vote." If it were, we never would have had George W. Bush as our president. Hmmm... I wonder what would have happened if this really were a democracy. Polls are what you're feeling NOW. In Nov, I'll be feeling Obama! What? A positive comment about Obama? Thank you, CNN! I really really really hope Obama wins, because it is the only chance our country has to survive the current mess. It looks like the reality of the financial crisis has snapped some voters back to reality, although I still don't believe polls are very reliable. People that like Obama are weak-minded sheep that like to screamed at, talked down to, chastised, scolded, and told that their country is no good. Prior to the Hover administration, the Republican Party did not deny that they ran up the deficit because it was the easiest way to transfer money from the poor to the wealthy – the quickest way to run up the deficit is WAR. The same rules apply in the party today, however it's no longer PC for the party to admit to this outright. If this type of administration continues to rule, this crisis, panic, depression, recession, what ever they choose to call it will only get worse. It will get worse anyway, but how long it will last is up to the people on Nov 4th. If this "Poll of Poll" includes polls by Fox, 3 percentage points should be added to Obama. lol. I don't know how MN fits in this mix. All I've seen is Obama yard signs, and bumper stickers. I've not seen ONE McCain yard sign. MN loves Obama. Polls lie. Obama troops on the ground here! "I'll get back to you later." It's a cult of personality, people. God help us if he's elected but if he is, you will see soon enough that there is ZERO substance. To all the brainwashed republicans and independents out there that keep saying Obama doesn't have a plan.....please go to his website or listen to him speak instead of just spewing out of your mouths. Obama has very clear plans on what to do. They're all outlined right in front of you people. Besides, you can't knock a guy that wants to think about some answers before just shouting them out and regretting them later like McShame. Stop drinking the Kool-Aid! Obama Baby, you are a good public speaker, but you are also the most liberal candidate that is the product of Chicago Southside Political Machine which has a long and rich history of political corruption of the first magnitude. You are indeed a child of that system and I don"t want you anywhere near the Oval Office...have a nice day. I have faith that PA, VA & OH will all be Blue!!!!!!! A couple of days ago CNN reported that battleground states were a toss up – now Obama is ahead – obviously, this election is teeter-tottering from day to day and CNN will always report the advantage to Obama. With all the aiding and abetting Obama has gotten from the media, from Hollywood, from Oprah W, The View and every other promotional outlet, if he loses, he truely will be a loser. McCain really is the underdog – but McCain will turn out to be one of the best President's this country has seen – why? Because he has the maveric reputation to live up to and contrary to all the ageist attitudes, jokes and marginalizing comments – his age will actually motivate him to leave a lasting Presidential legacy that will better this country. He knows it. Obama, on the other hand, who is very inexperienced and full mostly of himself instead of leadership qualities, will spend 4 years trying to find his way and then blame everything that goes wrong on the Bush years. I have the perfect solution for those who want vote for Barack Obama, because of race. Just image when you go to the polls. You have heard both candidate speak and they are both black or both white. Now make your decision. God help us all. By the time the debates are concluded, Obama/Biden will be ahead in most of the poles and they will win all the batleground states. None of the poles consider the fact that there are over 20,000, 000 new voters. They will give the Democrtic ticket the most votes and biggest win since Johnson....400 electoral votes for OBama/Biden!!!! People are finally beginning to realize that Barack Obama is the last remaining politician we can trust. I tell you, all you here Obama say is we need a plan to keep your jobs here and not have them go overseas. (Stop talking and tell us the plan). This has been the talk for all parties for years. The people are tired of talk. Did you know that the American govt provides tax breaks for all companies to manufacture goods overseas and re-import them for free into the US. If they want jobs to stay then stop the tax breaks for large corps. This is left overs from the car industry. Yea, can't wait for Obama to bite it at these debates...Check out the polls after Friday. He has ZERO substance. After all the dems have done (or in our case not done) in our state..Michigan is going red, just wait. I never thought I'd be for Obama after what he and Dean did to Hillary Clinton. Well, I'm not for Obama, but McCain is a self-proclaimed Know-Nothing when it comes to economics. Maybe we should vote for the lesser of the two evils: OBAMA. I hate that. I've been doing it most of my life. But I may have to. If McCain loses, it will be because of reverse racism.